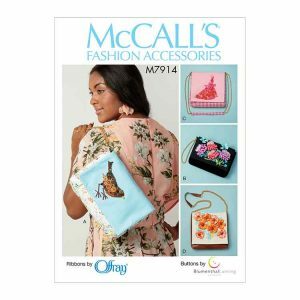 The latest collection of sewing patterns from McCalls. 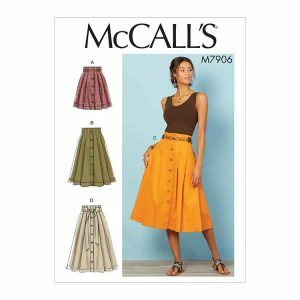 M7906 Very full pleated skirts are worn 2" above the waist and have button front, front and back facings, deep hem and length and carrier variations. A, C: Narrow carriers for purchased belt. D: Wide carriers and self tie belt. M7905 Semi-fitted skirts have invisible back zipper with hook and eye, and length variations. A: Contrast flounces. M7904 Loose-fitting shirt has button front opening with separate placket, collar with neck band, and length and sleeve variations. A, B, C: Shaped hem. D: Button cuff. 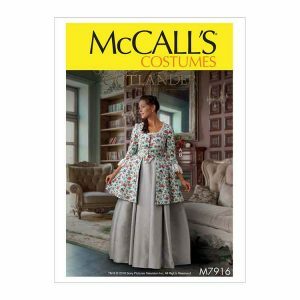 M7916 Close-fitting caraco jacket is fully lined and underlined, with front hook and eye closure, princess seams, boning, two-piece sleeves, and purchased lace trim. Full skirt is pleated, with waistband, continuous lap, and hook and bar closure. M7915 Chemise and Longline Corset costume. M7913 Unisex lined jacket and vest have snap closure front, side seam pockets, contrast pocket flap and collar facings, and pocket and sleeve variations. 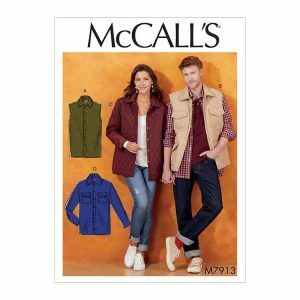 M7912 Loose-fitting jackets and vest are unlined with dropped shoulder, tie belt with thread carriers, and collar, length and sleeve variations. 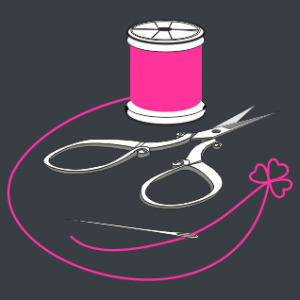 B, C, D: Patch pockets. M7911 Loose-fitting pullover top has neck binding, elasticized sleeves and flounce detail. Wrong side of fabric will show. Very loose-fitting pants are fully lined with flared leg, sheer overlay and invisible back zipper with hook and eye.